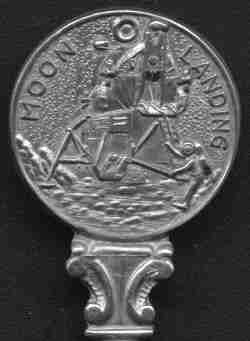 Normally I would not devote an entire exhibit to one silver plated spoon, but this is the only spoon that I have ever seen regarding the first landing of men on the moon. Many different type of commemorative souvenirs of the moon landing were made, and I know that lots of people collect space memorabilia. If you have an interest in space commemoratives, I have some other types in which you might be interested. IMHO, the first moon walk was one of the most important events of this century. I remember well sitting in my in-laws house on this very hot July evening and waiting impatiently as the spacecraft neared the moon and then landed. For some reason there was a long wait before NASA allowed Armstrong to actually set foot on the moon. But when he did, it was an event which I will always remember. 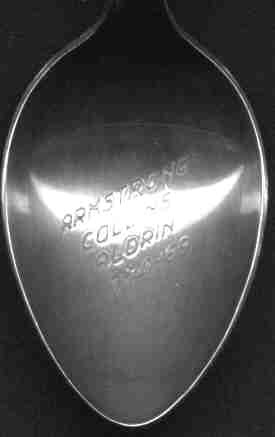 The bowl is engraved with the names "Armstrong, Collins, Aldrin"